An ornithological mystery has been solved! Puzzling red feathers have been popping up in eastern North America's "yellow-shafted" population of Northern Flickers, but they aren't due to genes borrowed from their "red-shafted" cousins to the west, according to a new study in The Auk: Ornithological Advances. Instead, the culprit is a pigment that the birds are ingesting in the berries of exotic honeysuckle plants. The Northern Flicker comes in two varieties–the birds of the west have a salmon pink or orange tinge to the undersides of their wings, while the eastern birds are yellow. Where the two populations meet in the middle, they frequently hybridize, producing birds with a blend of both colors. For years, however, flickers far to the east of the hybrid zone have been popping up with red-orange wing feathers. The prevailing explanation has been that they must somehow have genes from the western population, but Jocelyn Hudon of the Royal Alberta Museum and his colleagues have determined that the eastern birds' unusual color actually has a different source: a pigment called rhodoxanthin, which comes from the berries of two species of invasive honeysuckle plants. 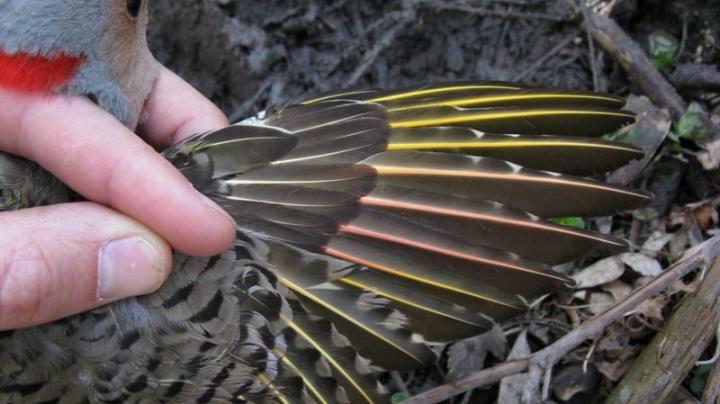 Hudon and his colleagues used spectrophotometry and chromatography to show that rhodoxanthin, rather than the type of carotenoid pigment that colors western red-shafted birds, was present in the feathers of yellow-shafted flicker specimens with the aberrant red coloration. Data from a bird-banding station helped confirm that the birds acquire the red pigment during their fall molt about early August, which coincides with the availability of ripe honeysuckle berries. The honeysuckles have also been implicated as the source of unusual orange feathers in Cedar Waxwings. "At one point considered valuable wildlife habitat and widely disseminated, the naturalized Asian bush honeysuckles are now considered invasive and undesirable in many states. This is clearly not the last we have heard of aberrantly colored birds," says Hudon. "The ready availability of a pigment that can alter the coloration of birds with carotenoids in their plumages could have major implications for mate selection if plumage coloration no longer signaled a bird's body condition." "This is the pinnacle of a lengthy series of papers on the pigments deposited in primary feathers. Hudon et al. make use of the most up-to-date spectrometric and biochemical analyses to identify and quantify the pigments," according to Alan Brush, an expert on feather color and retired University of Connecticut professor who was not involved with the study. "In addition to demonstrating that the red pigments in the molting yellow-shafted feathers are derived from their diets, not the result of interbreeding with the red-shafted form, they illuminate the dynamic nature of pigment deposition during molt, an accomplishment in itself." "Diet explains red flight feathers in Yellow-shafted Flickers in eastern North America" will be available October 12, 2016, at http://americanornithologypubs.org/doi/full/10.1642/AUK-16-63.1 (issue URL http://americanornithologypubs.org/toc/tauk/134/1).